I was so absorbed working on the AeroKnow website www.aeroknow.com that time got away from me Saturday forcing a mad rush to work at The Granite Guy on the edge of the world without taking some magazines and other material slated for processing at the airport AeroKnow Museum office. Even so, I was glad to be heading back to the airport on a beautiful, sunny day with half a Pepsi and a Quarter Pounder with Cheese, left over from lunch George had bought for me at “work.” Ate the fries and half the drink at the showroom desk; would sip the rest of the Pep’ at the Museum, and the QP with polyunsaturated cheesefoodproduct would be the “main course” for dinner at home. It remained in my truck when I breezed into the office. There were even a Piper Malibu and King Air on the ramp. First task on arrival was taking a six-foot bookcase up to the Kits Room, awkward but easy. I installed the case in place of a tall, two-door cabinet where models in progress and paint are kept after moving the cab closer to my workshop desk where I expect to be doing major repair and building after the dust settles from the move. Didn’t stay long because before 5:30, my presence in the ground floor AKM office is essential. That’s where the people (potential supporters) are. The move of materials aeronautical from home to airport, by the way, which began May 29 this year, is 99 percent complete. I am, for the moment, resigned to keeping thousands of books and aviation magazines at home in the basement even though I KNOW this is not a long-term arrangement. The humidity what ruined some model kits placed too close to the basement floor and other star-crossed locations will do the same to some periodicals if they stay in the basement. There is a CHANCE I may expand museum quarters at the airport to include them and to many thousand 35 mm slides now kept at home. The books, magazines and the rest of the photo collection need to be above ground and where better than at the airport. Zach and Dan at the FBO counter were cheerful as I had entered the lobby (They and the rest of the counter and line crew always are.) glad to be back in the groove on a nice day. So was I. After tweaking the arrangement of things in the office, picking of some more of the myriad paper scrap remaining from last week’s small clipping processing binge, I decided to use my modeling airbrush for the first time. The model at hand is a 1/72 scale Monogram X-15, the first model kit started at AeroKnow Museum. As the Rolling Stones suggested unintentionally in their 1960s maga-hit record, I decided to “paint it black.” I had arranged the wheeled cart next to the desk, put an old shirt over my lap to absorb Testor’s Model Master Flat Black enamel and thinner that might be accidentally spilled . . . . and heard a young boy calling to his dad to come look at the models. In a few seconds he was joined by his dad and older brother and had discovered me working on the model. 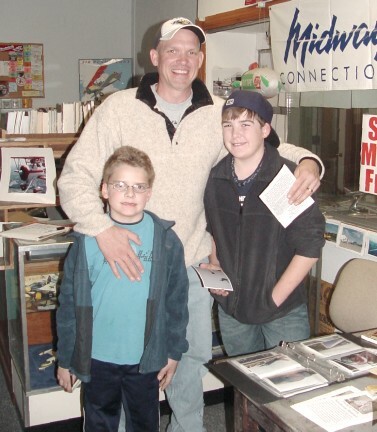 What followed was the best family visit in the short history of AeroKnow Museum. I explained what I was doing and asked the kids and their obvious dad if they recognized the airplane. Dad guessed “SR-71?” because it was black, and dad doesn’t remember North American’s incredible rocket-powered flying machine. I explained what it was and what an important airplane it was, and then stood up to welcome them. We talked about many of the models, what is going on with the Museum, and how they came to the museum. We were having such a fine time talking aviation history we didn’t get to introductions until we’d been talking almost 25 minutes. Ken Aschenbrenner learned how to fly at Capital Airport, often visiting the “Pilot Shop” that is now the home of AeroKnow Museum. Ken wondered about Don Malette who had run an earlier incarnation of the FBO based in the building called Capital Aviation. I told him I had known Don and considered him one of the great guys in local aviation. Ken attended college at University of Illinois “Chambana” and worked for a TWA offshoot on the ground in order to pay for time building hours in the air toward his Commercial License. He had grown up in nearby Rochester, Illinois. He’s now employed and living in Winston Salem, North Carolina and working to resolve some medical issues that are keeping him out of a left seat. His son Ben discovered the AeroKnow Museum soon after they arrived so Ken could see how things look years after he soloed from this airport. Ben and his dad are aviation Enthusiasts with a capital E and his older brother Evan, less so. Evan sat patiently as Ben, dad and museum guy babbled on and on and on and on. 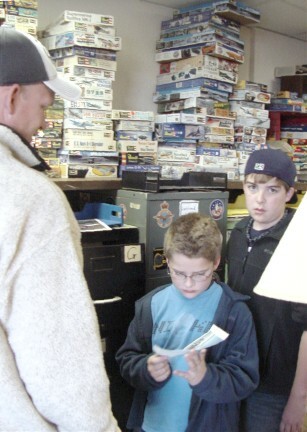 Ben wanted to buy a model kit and was disappointed none were for sale. I explained that good people who support AeroKnow Museum by becoming members of Abe Lincoln’s Air Force are allowed access to the Kit Room and Research Room upstairs where I MIGHT have a surplus model kit for sale. More about that in a future posting here. Ken didn’t hesitate an instant to join Abe Lincoln’s Air Force. THEN we went upstairs. 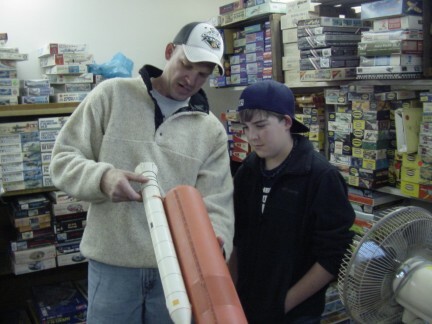 Ken and Evan examine a Space Shuttle model in progress. The Kits Room is “showable” to the public though a long way from perfect. It impressed the Aschenbrenners. During the time there I showed them some solid wood kits (Burkhards and Hawks) from the 40s, but the boys were intent on the more recent plastic kits, and we looked at a few, including a Hasegawa 1/48 Cessna Citation, not for sale. It will be the second new kit built at the Museum. Ben examines a clipping in the Research Room. I expected the sense of discovery evident in all three visitors to go down a notch as we transited to the Research Room, but Ken and Ben were taken by it as well. Evident is how the Kits Room does not display all the kits. Kits made by Monogram, Revell, Lindberg, Hawk and Italeri, are displayed, along with most 1/144 scale kits, on top of the filing cabinets. Fifteen minutes into our visit there, Ken noticed the time and explained he had promised the boys a visit to Abe Lincoln’s Home, a terrific historical landmark, and a trip to Radio Shack (Evan would get his reward for his commendable patience.) before returning to the boys’ grandmother’s house for dinner. Ben learns a lesson about decal placement. 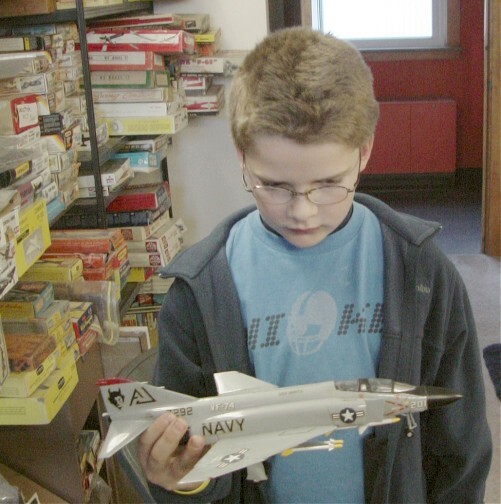 On the way back through the Kits Room, the future model builder noticed a 1/48 scale F-4 model that had been donated by the wife of a demised model builder. I had accepted it, along with some other items, not because of its historical importance but because of the lesson it teaches: that despite instructions that illustrate where to place decals, sometimes even grownups don’t pay the attention they should to those instructions. I explained why we could learn this from that model. The first reader of this post who posts a comment telling me the inaccuracy “planely” visible in the photo above, who expresses a desire to become a member of Abe Lincoln’s Air Force in support of Aeroknow Museum will win that membership at almost half price: $8 made payable toe AeroKnow and sent to 900 Capital Airport Drive, Springfield IL 62704. For more information about Abe Lincoln’s Air Force, visit the page dedicated to it at the AeroKnow website linked at the start of this post. I will be sending Ken Aschenbrenner his membership card and certificate first thing Monday morning. One of the last things Ken said departing for points south was how happy and joyful their discovery of AeroKnow Museum had been. I replied the same applied to meeting him and his sons. It was a most memorable encounter of the best kind, the most recent of a few and no doubt a harbinger of many more to come. Clear skies and happy landings! This entry was posted in aviation, aviation, Uncategorized. Bookmark the permalink. We have a winner to the “Guess what’s wrong with the Phantom model. Hayden Hamilton, webmaster and publications editor for American Aviation Historical Society e’d the correct answer which I will share in the Monday posting. If Hayden sends me $8 for his almost-half-price membership dues in Abe Lincoln’s Air Force in seven days, I will send him the official membership certificate, suitable for framing, and membership card, suitable for showing to friends who should know about AeroKnow. To learn about how to become a member of American Aviation Historical Society which AeroKnow totally recommends you join after supporting AeroKnow Museum, visit AeroKnow’s home page linked in the post above.